Garden Wise Living is working hard every day to share with you small ways to Live Green to save some Green and leave just a hint of a footprint on the world. We are excited about the New Garden Wise Living Green Build/Remodel features. When we began the planning for these features we were bombarded by questions and ideas, just as you are when you plan a project.What to use? What companies are truly Green? Green Washing? We soon became aware of the most important lesson in planning any project and that is consumer responsibility. Be aware, research and know were our products come from. We started our project by contacting David Geissler a Home Performance Auditor with Energy Star to get an idea of the Project Home Energy Score. The test performed by Mr. Geissler showed us the places that were allowing us to loose precious heat and allow the cold air in, He actually said that this Project Homes inside air is replaced by outside air 6 times every hour. We knew this Project home had problems but with his help we now know how big of a problem we have and can take steps to fix them and save some Green. Priority in mind, the first step is to replace the existing Shingle Roof. It is old and lifting allowing moisture to get in causing damage to the homes structure. Going Green here was easy, we did a lot of research and a Metal Roof was the obvious choice for us. A metal roof is forever, low maintenance and Recyclable. We chose Metal Sales whose manufacturing facilities are in Rogers Minnesota, just a few hundred miles from the Project and Garden Wise Living. 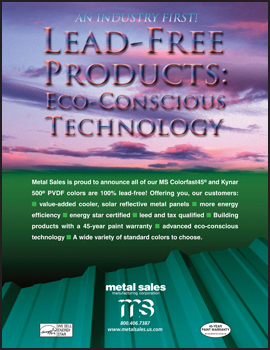 Metal Sales is known for its Green practices with lead free paint and delivery trucks that are following the Green path as well. During the <?xml:namespace prefix = st1 ns = "urn:schemas-microsoft-com:office:smarttags" />Home Assessment Garden Wise was told that the old Rock Vanier was falling away from the home allowing valuable energy to be lost. To fix this problem Garden Wise Living turned to Wisconsin Pride Stone a Local company that produces Beautifully Handcrafted Cultured Stone from the Heart of Wisconsin a product that is made from 85% recycled materials. Garden Wise Living is in the process of developing a Green Building Feature. The project is based around the Garden Wise Living Property on Witt Hill Rd. here in Wisconsin. The project will take viewers through several remodel projects that will create a Greener environment for Garden Wise Living and demonstrate how home owners can make Green changes in their homes as well. Metal Sales will be used for the Green Build Roof. A metal roof is a life long eco sound choice for the roofing. A metal roof is totally recyclable and maintenance free unlike the conventional non recyclable conventional roofing like shingles. Jim Austin, Senior Editor for the NEW Digital Magazine Rural Builder Green Magazine visited the Garden Wise Living Green/Build Remodel Project home last fall and did an interview with the Host of Garden Wise Living Arlena Schott and Metal Sales representative John Brown for an article he was preparing for the NEW magazine. To read the article sees the link below. For up dates and information on products being used on the Green Build/Remodel Features take a look at the Green Build /Remodel Page to the left and follow Garden Wise Living on Facebook and twitter.